There is one more piece of information that might reassure those concerned about food miles and the effect on the environment or looking for a local stamp of quality. Produced and packaged by Al Islami, United Arab Emirates. 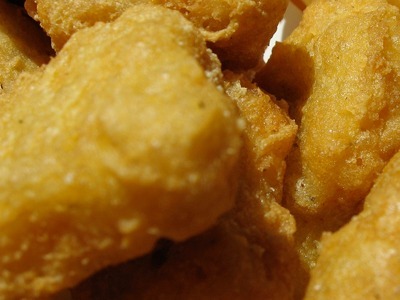 But there is more to the nuggets than meets the eye. The chicken is from Brazil, the bread crumbs from the United Kingdom and the wheat imported from Canada, Australia, Pakistan and Paraguay. The vegetable fat is processed in the UAE, but made from canola seeds imported from Canada. Spain supplies the emulsifiers, Germany the salt and stabilisers, while the dextrin, which enhances crispness, is Chinese. The spices are from India, of course, as are the flavour enhancer and textured vegetable protein. Fourteen ingredients and 11 countries. Here in a simple box of chicken nuggets is the country’s food supply in all its complexity – a global web of suppliers, producers and farmers who fill the shelves of supermarkets and corner shops in a desert land that once survived on little more than dates, fish and camels’ milk. Android users in the Middle East can finally get their hands on paid apps from the Android Market now that Google has added included the feature for 10 countries from in the region. If you’re an Android smartphone owner residing in Algeria, Bahrain, Jordan, Kuwait, Lebanon, Morocco, Oman, Qatar, Tunisia, and Yemen then you can purchase paid apps from the market. Other MENA countries, stand in line for the next update reported SaudiMac yesterday. What is shocking about this upgrade is the fact the three largest online countries in terms of mobile and Internet usage haven’t been included yet, them being Saudi Arabia, United Arab Emirates, and Egypt. Having asked around, we haven’t received any official response from Google, but it appears local carrier support is one of the major obstacles standing between paid apps from the Android market and users in those countries. Now for all you infuriated Android users in countries not yet blessed with the paid apps market, not to despair, we got you covered here at TNW ME. Although we don’t recommend developers who can launch their apps in the official Android Market to use these, deprived users can check out GetJar.com, Handango.com, and SlideMe.org. Users should be warned that this could mean rooting your device which voids the phone’s warranty, but if you want our opinion on the matter you really should have by now. Whilst the idea of a flash mob isn’t a new thing, a Dabke / Hip-Hop flash mob in Beirut Rafic Hariri International Airport (Beirut Duty Free) at a time when the region is in flux is certainly a first. On March 5th, 2011, passengers experienced something a little different. A flash mob performed a mix of Dabke and hip-hop to entertain and delight passengers and airport staff alike. M&C Saatchi and Beirut Duty Free, created this vibrant event as part of their “Take Back More.” campaign. The aim was to literally create a wonderful memory of Lebanon that passengers could take with them on their journey. A big desert lizard wreaked havoc inside a restaurant in Saudi Arabia when it sneaked into the place before it was auctioned for around $8, a newspaper reported on Saturday. Customers inside the restaurant in the central province of Ras ran out in panic when the lizard, weighing more than three kg, walked into the place, ‘Al Riyadh’ Arabic language daily said. The lizard had managed to flee municipality cleaners who seized it at a nearby cemetery and headed for the restaurant, apparently attracted by the smell of food, the paper said.